If they didn’t create enough havoc already with the deaths and injuries they cause on the nation’s roads, Americans’ cars, trucks, and motorcycles also create other big consternations, including harmful commuting stress, rising pedestrian carnage, and tough calls about when seniors ought to be forced to give up driving. Just how soon will it be before computers, robots, and autonomous vehicles ride to our rescue? Maybe not fast enough. Too many motorists, especially in urban centers, may see their heads and bodies blow up — in figurative fashion — due to the daily strains of trying to navigate traffic gridlock, reported Austin Frakt, director of the Partnered Evidence-Based Policy Resource Center at the V.A. Boston Healthcare System, associate professor with Boston University’s School of Public Health, and adjunct associate professor with the Harvard T.H. Chan School of Public Health. 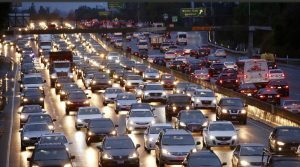 He wrote in the New York Times’ research- and evidence-based “Upshot” column that Americans spend 42 hours annually stuck in rush-hour jams, and traffic’s toll for lost time and wasted fuel exceeds $100 billion. 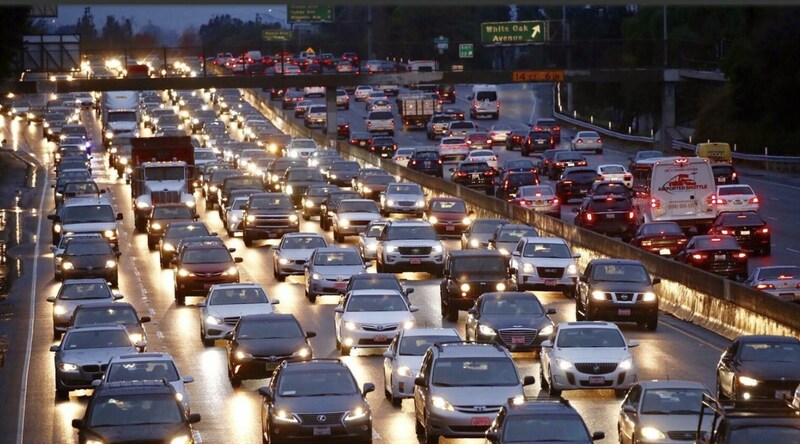 Commuting also lays waste to the mental and physical health of motorists and passengers, he noted, adding that car capitals like Los Angeles struggle with almost understandable incidents of road rage and other traffic-related violence. Faced with long, soul-sucking drives, Angelenos and others need to learn meditation and other stress-calming techniques to help them cope with the health damage that can be a by-product of crawling, inch by inch and against the clock, across a city jammed with millions praying to get home or to work. Although Frakt focuses on Los Angeles figures — and he may be conservative, contends a colleague out there who spent 4.5 hours or so a day getting a few miles across town for a job — Washington, D.C., has become its own poster-child for motor madness. In 2017, the average commute time in the nation’s capital was 34.9 minutes, which the Washington Post, quoting U.S. Census officials, termed one of country’s worst. The newspaper, also citing information from the Brookings Institution, says commuters should brace for yet more troubles ahead, with a still booming local economy and nightmares in the mass transit system certain to add to road woes and rises in area residents’ blood pressure. While Frakt makes a small point about the advantages that can be enjoyed by those who bike or walk to work, school, and chores, the District-based Smart Growth America has reported that warm-weather spots have become killer zones for rising vehicular deaths and injuries of pedestrians. There’s yet another demographic trend that ought to worry safety advocates: As the nation grays, when and how do families, friends, and other loved ones get seniors to come to grips with their age-related declines and give up driving? The issue flared into public attention, of course, when Prince Philip, the 97-year-old husband of Britain’s Queen Elizabeth II, got himself and his Land Rover into a fender-bender that resulted in minor injuries to two women in an oncoming car. Even as questions arose about the elderly royal’s mishap, he was sighted a day later, again driving himself and alone. The New York Times posted a piece with various reports examining aspects of the thorny issue of older drivers, including having the conversation about giving up their keys, striking a contract with them at earlier ages when it may be easier to persuade them to do so, and even taking drastic action (a daughter’s sneaking in and disabling her aged mom’s car). AARP, the nation’s largest and most influential group in advocating for older Americans, has useful resources online about training and safety for seniors on the road. In my practice, I see not only the harms that patients suffer while seeking medical services, but also the havoc that can be wreaked on them and their loved ones by car, truck, and motorcycle wrecks. In 2017 alone, more than 37,000 Americans were killed in vehicle crashes. They persist as a leading killer. We had made major strides in improving vehicle safety and reducing the national road toll. Research- and evidence-based policy helped lessen the chances that our cars would kill us: Lawmakers and regulators forced makers to use safer windshield glass, eliminate steering wheels that became bayonets, reinforce the cabin and doors against crushing, and redesign fuel and exhaust systems, so, for example, tail pipes didn’t spear gas tanks beneath drivers and passengers and cause giant, lethal explosions. This progress, sadly, has been rolled back, however, by higher speed limits, decreased attention and spending on roads, highways, bridges, and other infrastructure. We’ve all gotten too lax about safety. We’re distracted by devices, texting, eating, talking, and listening to too loud music. We drive while intoxicated by alcohol, marijuana, and prescription drugs (by themselves or in bad combinations with other substances). We drive when we’re too sleepy, and, when on motorcycles, we put our freedom over safety, making the tough but regrettable and allowed choice of not wearing a helmet. As the news stories indicate, we also injure our health and others due to long and angering commutes. Pedestrians are suffering too much. And we need to look again at whether older drivers still possess the skills and capacities to get behind the wheel. We’ve got a lot to think about and to take care of to keep ourselves safe on our streets and highways.